Editor’s Note – Have you ever used the idea of permaculture on your yardfarm? If you are interested in learning more, read below to get started. Looking to take your gardening game to the next level? Then it’s time you read up on permaculture. While perhaps best known as an agricultural philosophy, permaculture is defined by a set of principles that can be applied to all areas of life, from the energy we use to how we design our living spaces and process waste.1 But first and foremost, it’s all about transforming garden ecosystems in order to ensure the land, and people who benefit from it, can live healthy, sustainable lives for generations. Sounds like a great idea, right? If you’re ready to learn more, read on to find out what permaculture is (and isn’t) as well as tips for incorporating permaculture principles into your own garden. 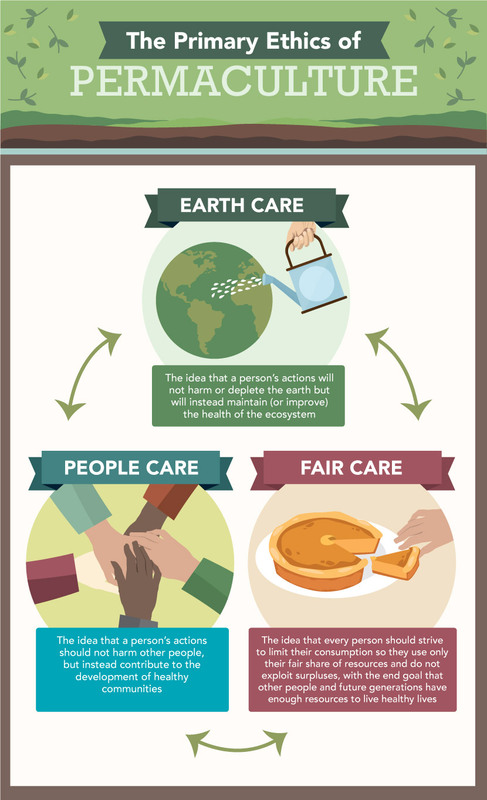 The idea that a person’s actions will not harm or deplete the earth but will instead maintain (or improve) the health of the ecosystem. The idea that every person should strive to limit their consumption so they use only their fair share of resources and do not exploit surpluses, with the end goal that other people and future generations have enough resources to live healthy lives. Because permaculture is premised on working with the local landscape, its implementation varies from place to place. But the basic principles to keep in mind regardless of your location are that permaculture emphasizes working with and learning from nature, prioritizing functionality of different garden components, and understanding that everything is interconnected.10 The following best practices will no doubt serve your first permaculture garden endeavor. Many permaculture practitioners aim to design their gardens in a way that mimics systems found in nature; in the process, they tend to benefit from higher yields.11 For example, it’s a great idea to create a mini-forest within the garden ecosystem, complete with a canopy of taller trees stacked over smaller trees, shrubs, and smaller crops.12 Mimicking nature helps ensure biodiversity within your garden, which maximizes the health of both plants and wildlife. Before planting anything, take some time to think about which crops require the most care, which you’ll harvest most often, and so on. 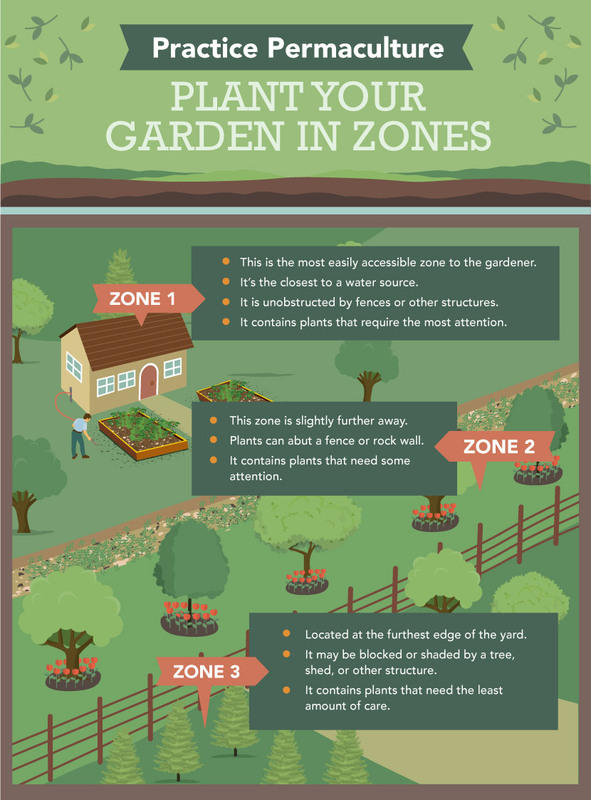 Then try to plant in zones, so the most accessible zone consists of the plants that require the most attention, and the zone furthest from view contains plants that require less upkeep.13 That way you increase the likelihood that each plant gets the appropriate amount of care and delicate plants don’t wither away in the back of the garden. For example, some spots receive more direct sunlight, while others stay dark and cool all day long. Some spots (such as rocky areas) may stay dry, while others experience poor drainage. Take advantage of these naturally occurring microclimates by planting crops that thrive in the different conditions. As in any type of garden, the soil will stay healthier if you plant a diversity of crops and avoid planting the same thing in the same place year after year.17 It can be helpful to keep a written record of each year’s garden so you’re able to keep track of what you plant where and when. Because permaculture principles emphasize waste reduction, compost is an essential element of the closed-loop system. Compost food scraps and yard waste, and you’ll have a continual supply of fertile soil to nurture your garden (which yields lots of produce, which leads to more food scraps, which results in more compost). In keeping with the permaculture’s “waste not” philosophy, it’s a great idea to design a system that allows you to capture and store rainwater so you can put it to use around your home.22Similarly, ensuring your soil drains properly and installing porous surfaces (instead of concrete or asphalt) can help put water to good use instead of wasting it or contributing to harmful runoff. Like compost, chickens aid a healthy closed-loop system.23 Chicken manure contains plenty of nitrogen and other nutrients that are essential for healthy soil; free-roaming chickens also offer great insurance against garden pests. Chicken waste can be used as mulch, and chickens happily consume any leftover kitchen scraps. And if that’s not enough, they supply healthy and delicious eggs. Many permaculture practitioners also swear by the presence of other livestock, such as goats, sheep, and cows. If all of this feels a little overwhelming, don’t worry. You can ease your way into permaculture by choosing one or two design concepts that really appeal to you and incorporating them into your garden. As you implement permaculture principles in your garden, don’t be surprised if you see this kind of holistic thinking blend into other areas of your life. At its best, permaculture is a lifestyle – one in which you embrace what nature has to offer and live to sustain these gifts for generations. Crowdfunding Tomatoes: Technology Platform Allows Consumers to Fund Produce Shouldn’t We Treat Farmers More Like Ministers?